Forecasts: how wrong will Treasury get it this year? Treasury always gets it wrong -- but is the margin of error acceptable? 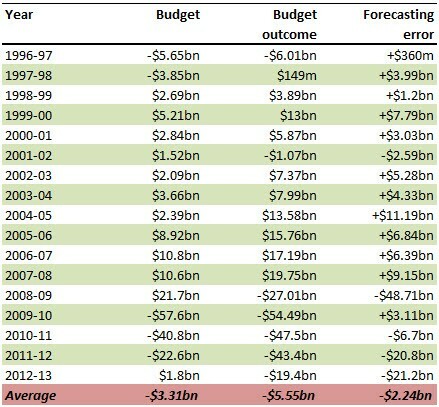 History shows it has a variable record, and suggests what Wayne Swan's deficit might end up being. Yesterday’s MYEFO figures reveal in clear terms just what a policy disaster the current version of the CPRS is. It also gives the lie to the absurd line from ETS opponents that the CPRS is a giant tax. Wayne Swan has unveiled a significant improvement in the Government’s fiscal position from next year, with this morning’s Mid-Year Economic Forecasts showing far higher economic growth and lower unemployment than the Budget forecast back in May.